The Gilbert and Ellice Islands were a British protectorate from 1892 and colony from 1916 until 1 January 1976, when the islands were divided into two colonies which became independent nations shortly after. A referendum was held in December 1974 to determine whether the Gilbert Islands and Ellice Islands should each have their own administration. As a consequence of the referendum, the Gilbert and Ellice Islands colony ceased to exist on 1 January 1976 and the separate countries of Kiribati and Tuvalu came into existence. The Gilbert Islands (formerly Kingsmill Islands) are a chain of sixteen atolls and coral islands in the western Pacific Ocean that are recognised as part of the Micronesia subregion of Oceania. The Gilbert Islands are the main part of what is now Republic of Kiribati ("Kiribati" is the Gilbertese rendition of "Gilberts") The atolls and islands of the Gilbert Islands are arranged in an approximate north-to-south line. In a geographical sense, the equator serves as the dividing line between the northern Gilbert Islands and the southern Gilbert Islands. The Ellice Islands are south of the Gilbert Islands. The Ellice Islands comprises three reef islands and six true atolls spread out between the latitude of 5° to 10° south and longitude of 176° to 180°, west of the International Date Line. The Ellice Islands are midway between Hawaii and Australia. The Ellice Islands are recognised as part of the Polynesia subregion of Oceania. In 1606 Pedro Fernandes de Queirós sighted Butaritari and Makin, which he named the Buen Viaje (‘good trip’ in Spanish) Islands. The Gilbert Islands were named in 1820 by a Russian admiral, Johann von Krusenstern after a British captain, Thomas Gilbert, who encountered the archipelago in 1788 while exploring an Outer Passage route from Port Jackson to Canton. French captain Louis Duperrey was the first to map the whole Gilbert Islands archipelago. He commanded La Coquille on its circumnavigation of the earth (1822–1825). Funafuti atoll was named Ellice's Island after Edward Ellice, a British politician and merchant, by Captain Arent de Peyster, who sighted the islands in 1819 sailing on the ship Rebecca. Ellice owned the cargo of the ship. The name Ellice was applied to all nine islands, of what is now Tuvalu, after the work of English hydrographer Alexander George Findlay. The Gilbert and Ellice Islands were formerly designated an ISO 3166-1 alpha-2 country code "GE" until 1977. A protectorate was generally established over this area (but not over these islands) by the Pacific Islanders Protection Act of 1857 and then in 1877 for the Western Pacific Territories. The sixteen islands of the Gilberts were declared a British Protectorate by Captain Davis R.N., of HMS Royalist between 27 May and 17 June 1892. The Ellice Islands were declared a British Protectorate by Captain Gibson R.N., of HMS Curacoa, between 9 and 16 October of the same year. The British Western Pacific Territories (BWPT) were administered by a High Commissioner resident in Fiji. A Resident Commissioner, Charles Swayne, was appointed for the Ellice Islands in 1892 and for the Gilbert Islands in 1893. He was succeeded by W. Telfer Campbell in 1896, who established himself on Tarawa Atoll and remained in office until 1908. Telfer Campbell was criticised for his legislative, judicial and administrative management (including forced labour alleged to be exacted from islanders) and an inquiry was held by Arthur Mahaffy, a former colonial official in the Gilberts, resulting in a report in 1909. In 1913 an anonymous correspondent to the New Age journal described the maladministration of Telfer Campbell, linked it to criticisms of the Pacific Phosphate Company which was undertaking major industrial operations in the Islands, and questioned the impartiality of Mahaffy. The seat of government was then moved to Ocean Island (now known as Banaba Island), which had been included in the protectorate in 1900, to take advantage of the improved shipping connections resulting from the Company's activities, and the status of the islands was changed on 12 January 1916 to that of a Crown Colony. The role of the British colonial authorities emphasised the procurement of labour for the mineworkings and keeping order among the workers. Fanning Island and Washington Island also became included in the colony together with the islands of the Union Islands (now known as Tokelau); Christmas Island was included in 1919 but was contested by the U.S. under its Guano Islands Act of 1856, which allowed for very wide-ranging territorial claims. The Union Islands were transferred to New Zealand administration in 1926, abolishing their chiefdoms. The Gilbert and Ellice Islands Colony continued to be administered by a Resident Commissioner. In 1930 the Resident Commissioner, Arthur Grimble, issued revised laws, Regulations for the good Order and Cleanliness of the Gilbert and Ellice Islands, which replaced laws created during the BWTP. The Phoenix Islands were added to the colony in 1937. Banaba Island (Ocean Island) remained the headquarters of the Colony until the British evacuation in 1942 during the Pacific War as Ocean Island and the Gilbert Islands were occupied by the Japanese. The United States forces landed in Funafuti on 2 October 1942 and on Nanumea and Nukufetau in August 1943 and constructed an airfield on each island and other bases. The atolls of Tuvalu acted as a staging post during the preparation for the Battle of Tarawa and the Battle of Makin that commenced on 20 November 1943. Colonel Fox-Strangways, was the Resident Commissioner of the Gilbert and Ellice Islands Colony in 1941, who was located in Funafuti. After World War II, the Colony headquarters was re-established on Tarawa, first on Betio islet and subsequently on Bairiki islet. By the Tokelau Act of 1948, sovereignty over Tokelau was transferred to New Zealand. The five islands of the Central and Southern Line Islands were added to the colony in 1972. The Tuvaluans were concerned about their minority status in the Gilbert and Ellice Islands Colony. 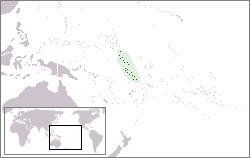 In 1974, ethnic differences within the colony caused the Polynesians of the Ellice Islands to vote for separation from the Micronesians of the Gilbert Islands (later Kiribati). The following year, the Ellice Islands became the separate British colony of Tuvalu. In 1947 Tarawa, in the Gilbert Islands, was made the administrative capital. This development included establishing The King George V Secondary School for boys and the Elaine Bernacchi Secondary School for girls. A Colony Conference was organised at Marakei in 1956, which was attended by officials and representatives from each island in the Gilbert and Ellice Islands Colony, conferences were held every two years until 1962. The development of administration continued with the creation in 1963 of an Advisory Council of five officials and 12 representatives who were appointed by the Resident Commissioner. In 1964 an Executive Council was established with eight officials and eight representatives. The representative members were elected in the Gilbert and Ellice Islands Advisory Council election held in 1964. The Resident Commissioner was now required to consult the Executive Council regarding the creation of laws to making decisions that affected the Gilbert and Ellice Islands Colony. A Constitution was introduced in 1967, which created a House of Representatives for the Gilbert and Ellice Islands Colony that comprised seven appointed officials and 23 members elected by the islanders. Tuvalu elected four members of the House of Representatives. The 1967 Constitution also established the Governing Council. The House of Representatives only had the authority to recommend laws; the Governing Council had the authority to enact laws following a recommendation from the House of Representatives. A select committee of the House of Representatives was established to consider whether the Constitution should be changed to give legislative power to the House of Representatives. It became apparent that the Tuvaluans were concerned about their minority status on the Gilbert and Ellice Islands Colony, and the Tuvaluans wanted equal representation to that of the I-Kiribati. A new constitution was introduced in 1971, which provided that each of the islands of Tuvalu (except Niulakita) elected one representative. 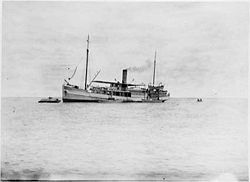 However that did not end the Tuvaluan movement for independence. In 1974 Ministerial government was introduced in the Gilbert and Ellice Islands Colony through a change to the Constitution. A referendum was held in December 1974 to determine whether the Gilbert Islands and Ellice Islands should each have their own administration. As a consequence of the Ellice Islands self-determination referendum, 1974, separation occurred in two stages. The Tuvaluan Order 1975 made by the Privy Council, which took effect on 1 October 1975, recognised Tuvalu as a separate British dependency with its own government. The second stage occurred on 1 January 1976 when two separate administrations were created out of the civil service of the Gilbert and Ellice Islands Colony. The British conducted a formal inquiry into Tuvaluan attitudes towards secession, and announced that a referendum was to be held, in which Tuvaluans could choose to remain with the Gilberts or secede. They were told that if they separated they would not receive royalties from the Ocean Island phosphate or other assets of the colony. Despite this, 3799 Tuvaluans (92%) voted to secede, while 293 voted against secession. In 1 October 1975, legal separation from the Gilbert Islands (now Kiribati), took place. On 1 January 1976, full administration of the new colony was transferred to Funafuti from Tarawa. Tuvalu became an independent constitutional monarchy and the 38th member of the Commonwealth on the 1 October 1978. The Gilbert Islands attained independence on 12 July 1979 under the name Kiribati by the Kiribati Independence Order 1979, as a republic with Commonwealth membership. That day the colonial flag was lowered for the last time with a parade commemorating both the newly independent state and in memorial of the intense battles fought on Tarawa in World War II. The parade included many dignitaries from home and abroad. The name Kiribati (pronounced kʲiriˈbas) is a linguistic derivative of "Gilberts." Banaba Island, formerly rich in phosphates before becoming fully depleted in the latter colonial years, also sued for independence in 1979 and boycotted the Kiribati ceremonies. The Banabans wanted greater autonomy and reparations of around $250 million for revenue they had not received and for environmental destruction caused by phosphate mining practices similar to those on Nauru. The British authorities had relocated most of the population to Rabi Island, Fiji after 1945, but by the 1970s many were returning to Banaba. The British rejected the Banaban independence proposal, and the island remained under the jurisdiction of Kiribati. 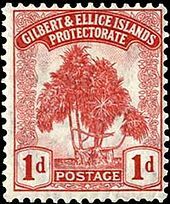 The Islands used their own postage stamps from 1911. ^ a b c d e f Tito Isala & Hugh Larcy (ed) (1983). "Chapter 20, Secession and Independence". Tuvalu: A History. University of the South Pacific/Government of Tuvalu. pp. 153–177. ^ McIntyre, W. David (2012). "The Partition of the Gilbert and Ellice Islands" (PDF). Island Studies Journal 7 (1): 135–146. ^ a b Reilly Ridgell. Pacific Nations and Territories: The Islands of Micronesia, Melanesia, and Polynesia. 3rd. Ed. Honolulu: Bess Press, 1995. p. 95. ^ Very often, this name applied only to the southern islands of the archipelago. Merriam-Webster's Geographical Dictionary. Springfield, Massachusetts: Merriam Webster, 1997. p. 594. ^ "Agreement between Tuvalu and Kiribati concerning their Maritime Boundary" (PDF). 29 August 2012. ^ "Maps of Tuvalu". Retrieved 21 October 2011. ^ Maude, H.E. (1959). "Spanish Discoveries in the Central Pacific: A Study in Identification". The Journal of the Polynesian Society 68 (4): 284–326. ^ Kelly, Celsus, O.F.M. La Austrialia del Espiritu Santo. The Journal of Fray Martín de Munilla O.F.M. and other documents relating to the Voyage of Pedro Fernández de Quirós to the South Sea (1605-1606) and the Franciscan Missionary Plan (1617-1627) Cambridge, 1966, p.39, 62. ^ Chambers, Keith S. and Munro, Doug (1980). "The Mystery of Gran Cocal: European Discovery and Mis-Discovery in Tuvalu". The Journal of the Polynesian Society 89 (2): 167–198. ^ Laumua Kofe & Hugh Larcy (ed) (1983). "Chapter 15, Palagi and Pastors". Tuvalu: A History. University of the South Pacific/Government of Tuvalu. pp. 103–104. ^ Resture, Jane. "TUVALU HISTORY – 'The Davis Diaries' (H.M.S. Royalist, 1892 visit to Ellice Islands under Captain Davis)". Retrieved 20 September 2011. ^ a b c Noatia P. Teo, Hugh Larcy (ed) (1983). "Chapter 17, Colonial Rule". Tuvalu: A History. University of the South Pacific/Government of Tuvalu. pp. 127–139. ^ Mahaffy, Arthur (1910). "(CO 225/86/26804)". Report by Mr. Arthur Mahaffy on a visit to the Gilbert and Ellice Islands. Great Britain, Colonial Office, High Commission for Western Pacific Islands (London: His Majesty's Stationery Office). ^ Correspondent (5 June 1913). "Modern buccaneers in the West Pacific" (PDF). New Age: 136–140. ^ Annexation of the Gilbert and Ellice Islands to his Majesty's dominions : at the Court at Buckingham Palace, the 10th day of November, 1915. Great Britain, Privy Council, Gilbert and Ellice Islands Order in Council, 1915 (Suva, Fiji : Government Printer). 1916. ^ (Imperial). (1875). "Pacific Islanders Protection Act, ss. 6-11". Retrieved 20 January 2015. ^ a b c Macdonald, B. K. (1982). Cinderellas of the Empire: Towards a History of Kiribati and Tuvalu, Australian National University Press, Canberra. ^ Lifuka, Neli; edited and introduced by Klaus-Friedrich Koch (1978). "War Years In Funafuti" (PDF). Logs in the current of the sea : Neli Lifuka's story of Kioa and the Vaitupu colonists. Australian National University Press/Press of the Langdon Associates. ISBN 0708103626. ^ Maude, H. E., & Doran, E., Jr. (1966). The precedence of Tarawa Atoll. Annals of the Association of American Geographers, 56, 269-289. ^ Williams, M., & Macdonald, B. K. (1985). The phosphateers: A history of the British Phosphate Commissioners and the Christmas Island Phosphate Commission. Melbourne University Press, Carlton, Vic. ^ a b Enele Sapoaga, Hugh Larcy (ed) (1983). "Chapter 19, Post-War Development". Tuvalu: A History. University of the South Pacific/Government of Tuvalu. pp. 146–152. ^ General election, 1974 : report / Gilbert and Ellice Islands Colony. Gilbert and Ellice Islands Colony. Tarawa: Central Government Office. 1974. Barrie Macdonald, Cinderellas of the Empire: towards a history of Kiribati and Tuvalu, Suva, Fiji: Institute of Pacific Studies, University of the South Pacific, 2001. ISBN 982-02-0335-X (Australian National University Press, first published 1982). Ghost Stories and Other Island Tales by I.E.Butler, published by Tom Butler, 2014, ISBN 978-1500505929 An account of the life of a young colonial officer in the 1950s in the Gilbert Islands. This page was last modified on 1 September 2015, at 17:12.